Journey to the Cross, the Tomb, the Resurrection. Maybe you have come to a place in your life that feels like a dead end, you’re going nowhere, life seems hopeless. Maybe you think that you have sinned one too many times, failed too many times, keep doing things you don’t want to do but you do them over and over again. Maybe you feel you’re at the end of the rope, the stress, the worries, about money, health, family, children, the state of the world, or the area you live in. You’ve tried to “get it together”. You’ve tried to have a “stiff upper lip”. You’ve tried will power or “pulling yourself up by your own bootstraps”. All your efforts have been ineffective and you have realized you can’t change anything on your own or in your own strength. It’s beyond your capabilities. I have some good news! If we could fix, rescue, save ourselves, we would not need a Savior, a Deliverer, an Advocate, a Rescuer, a Redeemer, a Great Physician, a Comforter. If we could live up to all that is right and have good health, with plenty of money to spend, we would probably be so high-minded and so full of our own self-righteousness, with our homes full of material worthless possessions. We would not hear the cries of the broken, let alone be aware of them or understand them. It is when we are broken and humbled, brought low and become weak, finally hearing and seeing, and hoping that someone will hear and see us, it is in this state real Love steps in. God knew we needed Him. Before we asked, He had the answer. Before we looked, He was standing before us. Before we knocked, He was in our midst. Before we died, He died for us so we could live. Before we went to hell, He descended into hell, broke the gates, and set the hostages free, breaking the chains, and overcame the demons. As a Christian you may know all this in your head, but getting it to sink deep down into our hearts is another matter. Just by being honest with God, knowing we can’t change ourselves, is the first step. This is where God’s mercy and grace comes in to transform our lives. This is what Easter is all about. Perhaps Easter is not a big celebration because we are still focusing on pain, sin, suffering, death and all of our dreams and hopes have been buried at the bottom of the sea or in a mile high mud slide. We are stuck on “Good Friday & Great Saturday” and we can’t see anything “good or great” about it. Except we can’t just stop there. Yes, there is a time to deal with our sins and failures, life’s disappointments and tragedies. 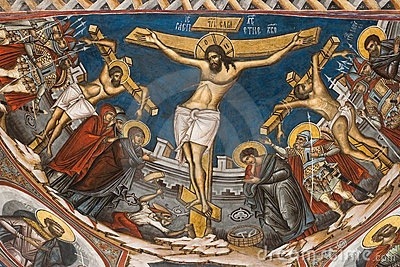 We need to remember the “Via Delarosa” the road to Christ’s crucifixion; how Jesus carried the load if humanity’s sins, failures and tragedies to calvary and then was nailed with all of this to the Cross. We need to remember how the Lamb of God loved us, was slain for us and died for us, even while we were still at war with God and still God’s enemy. We need to be reminded no matter how perfect or good we might think we are, even then we are filthy rags compared to the perfection and holiness of God. We are never going to measure up, will always fall short. We are set in our own selfish ways, no matter how close we get to God, we will still tend to be selfish and self-willed. This is why we need God. This is why Jesus died. We need a Savior. As it was for Christ God, we too must go through death… death to our own ideas of somehow earning our way into God’s presence; death to our own works of righteousness and good works; death to our own ways, our own dreams. We also need to let Jesus take our sin, even when we can’t give it to Him. Only in dying can we obtain new life. 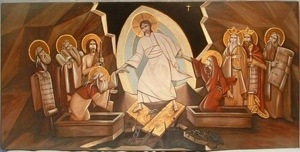 Jesus trampled down death by death. Easter is about Jesus conquering death, not us conquering death, but God. Only by hiding in the shelter of His wings, coming under His robe, being washed in His blood, losing ourself in Jesus, will we too conquer death. God has been faithful through centuries of generations of individuals who have put their trust in Him. God is faithful even when we are not. The steadfast love of The Lord never ceases, His mercies never come to an end. They are new every morning. We can take Him at His Word. Right now, our lives may be full of stress and very topsy turvy. I know that better days are ahead if we put our trust in the Lord. I also know things might get full of trials and tribulations and temptations. The Spirit of The Lord will come upon our lives to comfort us, walk beside us, live inside us, will be our strength, will pray for us when we don’t know how. God will give us a peace that passes understanding, a joy overflowing, a hope everlasting, a trust that is faithful and a love all fulfilling. More than what we can ask, think, or comprehend. He opened the way to Life and not an ordinary one but an abundant life. He gave us something stronger than “happiness”, He gave us JOY! He loves us unconditionally with an everlasting love. He takes as we are and transforms us into what we were destined to be. I truly am blessed and I do mean blessed when I remember the people, friends, family, even strangers who have come into my life. God had sent all of them, even those who have meant evil, all we’re sent by God. All have helped me in so many ways to bring me closer to God; to find enjoyment in this life; see things through the eyes of a child; to see the wonders of the world around me and so much more to discover. 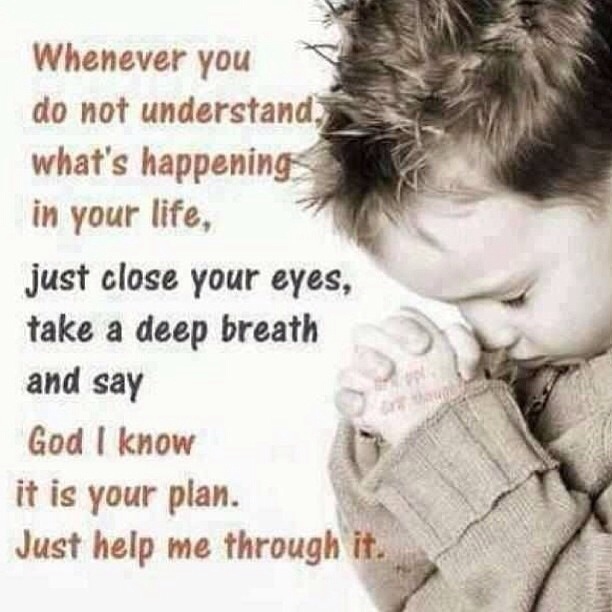 To truly pray “Our Father, Your kingdom come, Your will be done on earth as it is in heaven”. Now everyday I ask myself, “In the light of Eternity, what does it matter?” It puts into perspective what is eternally important and what is going to pass away. I want to know Christ in the fellowship of His sufferings, that I might know Him in the power of His resurrection. Christ is risen! In Truth He is risen! He is risen indeed! Years have passed since I first found Christ, or rather since Christ found me. Yes, Christ found me and I rebelled at first, then finally bowed my knee. I claimed Him as my Savior and Lord, my God and my Master. No other God would I serve. But since that day, long ago, my feet have trodden many a time in places forbidden and dark. I, so often, have been drawn away to other masters, other gods who gave enticing yet deceptive treats that when grasped would crumble into dust; or when eaten turned bitter and full of bile when swallowed. So, I have paid the price of tasting forbidden fruit. I have suffered the pain of grabbing thorns. I have known the shackles of fierce demons unrelenting in their torture. In fear and darkness, anxiety and unforgiveness, I walked through the valleys of the shadow of death. ​In the depths of despair, I heard footsteps pursuing me. Afraid of the Presence of God, I hid but being so exhausted and tired, I surrendered to His One pursuit. I collapsed in His arms, not caring if He would slay me, for death itself would be better than living in the squalor and mire I was now in. ​I cried out, “Lord, save me, deliver me, have mercy.” Then a light began to burn and the Presence of Whom I had surrendered to was the One I had always longed for. The Lord Jesus was the One who had been pursuing me relentlessly and never ending. He enveloped me in His arms. His love washing over me like wave after wave, cleansing, healing, forgiving. God — I thought He was a fierce Master and a Lord that I could never appease. He was truly fierce and worthy of respect — for He was all powerful, so holy. Now, for the first time, I was given fresh revelation. Just as fierce was His righteousness, His love was equally fierce. I now surrendered to the lover of my soul. ​I remember when I was young in Christ, visions and dreams enveloped my nights. By day, I was filled with an insatiable desire, an unquenchable thirst and hunger for God. I had a gnawing ache deep within that I was called to a purpose — a great and mighty plan. I’ve caught glimpses of His plans. I am still not sure what it all means. I am not sure about the why’s, what’s, or the when’s. His ways are always higher than mine. His ways are past finding out. ​God has given many gifts, skills and talents all I need is a desire to try and do my best for Him and surrender those gifts to Hitoshi use or not to use. I am so very thankful and so very blessed. It seems the Lover of my soul continues to shower me with His incredible treasures. ​I am learning submission and obedience within God’s will. I can trust God to work all for good. I am learning more and more the balance between grace and obedience. I am learning evermore the depths and the heights of His great love, mercy, forgiveness and grace. I am also learning that with the joy there is also the fellowship of His suffering. That love often bears a cross and a crown of thorns. But love never loses focus of the goal and will always prevail and endure. ​I believe in trusting God with my future and leaving it in His hands. For I have learned that just when I think I know — that is when I am most ignorant. It is better to be like Mary, the mother of Jesus, and ponder the things in my heart than it is to speak too hastily. Finally, there comes a time when we are the adults. Mom and Dad are no longer there to run to and we have no answers. They are not there to hold us or wipe the tears from our eyes. We get hurt, cry on our pillow, then try and remember all those sayings we were told as a child. Yet, it doesn’t take the pain away anymore. But, did it really ever help before? Maybe, it merely would hide it for awhile… until the next time. What do they really tell us? What good were all those sayings? ​Many times my walls have gone up… walls of bitterness, mistrust, unforgiveness and hurt. I have made silent vows of: not letting anyone get too close; not letting myself become vulnerable; not letting anyone see me as I really am; not willing to love wholeheartedly. ​But God’s relentless, pursuing love starts calling, wooing, and melting those walls. His love begins to permeate once again my heart, my life. I begin reaching out, touching others, loving again. ​His love — it’s beautiful; it’s wonderful; it’s a sweet aroma, an enriching fragrance. I am lifted, refreshed, strengthened and renewed! My hope is built. My faith is encouraged. My trust is renewed. My heart is softened. I learn to love again. ​Then it happens, my heart is tested by those very same areas that hurt, those same words, those same actions, the same pain, the same wound — reopened all over again. The only thing that may be different is the people have different names or faces. I tend to slip into disillusionment, despair, disappointment. Feeling rejected, lost, hurt, hopeless and lonely. The loneliness is the part we all hate. The loneliness we can feel even when we’re in a crowd. May those lonely times drive me to the Lord Jesus Christ, the only one who can satisfy a lonely heart, fulfill my deepest longings, heal the wounds of pain. As I stop seeking and pursuing after worldly pleasures and turn my efforts and affections toward the love of God will I find fulfillment. As I let go of all memories, all the people, all the hurts, all the longings, will I find my heart satisfied. In losing my life, I find it. In giving, I receive. In dying, only then shall I live. Sticks and stones may kill the body, but they cannot kill the soul. There is a friend that sticks closer than a brother. There is a friend that will never leave nor depart. There is a friend whose love will never change. So, I have sought Him often alone — but not often enough. I know He desires me more than I Him, but that will probably always be that way. I feel as though I have been in a desert and yet I have not been forsaken. There is hidden beauty in the desert. I believe I have passed from a romantic feeling of love into a deep and abiding lasting love that goes far beyond feelings and into a deep sense of knowing. ​I am at peace and am content with God. I feel comfortable with my relationship and settled. Yet, at the same time, paradoxically, I am restless, hungry, thirsty. I am satisfied but ever yearning for more of Him. I am in pursuit of God, yet at rest. ​Yes, I have made up my mind. I will continue on this path, wherever the Lord may lead. I will stick with my God, my Lord, the one I love and am learning to love over and over again in fresh and new ways. I plan on hanging in through all the trials. I will not run from fear. I will face whatever the future may bring and take the risk of bearing a cross. ​I may stumble, but I will go on. Ultimately, my deepest longings will be fulfilled and I will accomplish His purpose to which I’ve been called. Only by walking through the desert can I expect to enter that promised land. Like Jacob I will hold on until I receive the blessing. Even if, in holding on, it may appear to my natural eyes that I am crippled some way, in the end, every good thing has a price. ​If I fail to hear God’s voice and find myself lost along the way, even in my wanderings I will be okay. I know that my Lord Jesus, is the Good Shepherd and will pursue and seek me. I can trust in God, alone, who can redeem anything that is lost including wayward dreams. He can make mistakes turn for good. He can make the foolish become wise — the strong become weak and the weak become strong. He can redeem the years that the locusts have eaten. He can bring beauty out of ashes and turn mourning into joy. He holds all things in His hands. He is sovereign and will accomplish His purpose and work in my life what He desires. So, I can face the future with assurance and hope. I am bathed and washed in His goodness and love. ​Praise His name forevermore. He will keep me as the apple of His eye and hide me in the shelter of His wings. He is my God and I will be His servant forever! Not by my might, nor by my power, but by the grace of His Spirit! ​In Him and through Him we can reach out. By Him and because of Him we can love again. Because nothing will ever be able to separate us from the love of God which is in Christ Jesus our Lord except our own selves. We know that His perfect love will cast out all fear. Then the world will know we are His disciples by our love! Of all the ancient stories that surround Christmas, the tale about King Wenceslaus (spelled Vatslav or Vyacheslav) stands out. Though the carol was composed by noted songwriter and priest, John Mason Neale, the song is based on historical fact. King Wenceslaus was a real member of European royalty, a ruler who daily touched his subjects with Christian kindness and charity. For many in the Dark Ages, this king was the role model for Christian leaders. Today, over a thousand years after his death, King Wenceslaus remains a role model for Christian people everywhere. 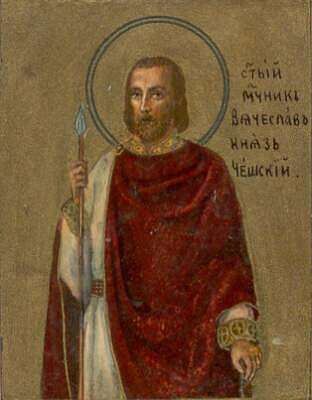 The son of Duke Borivoy (Bratislav) of Bohemia, Saint Wenceslaus had the good fortune to be raised by his grandmother, holy Martyr and Princess Ludmilla (commemorated September 16). Ludmilla was a devoted Christian woman who raised Prince Wenceslaus in deep piety, teaching her grandson the meaning of faith, hope, and charity. Wenceslaus took his grandmother’s lessons to heart, and in 920, when Duke Borivoy (Bratislav) was killed in battle, the youngster seemed ready to put what he had learned into action. At the age of eighteen, Saint Wenceslaus, just a few minutes older than Boleslaus, was made the leader of Bohemia. In spite of his youthful age, he ruled wisely and justly and concerned himself much about the Christian enlightenment of the people. The holy prince was a widely educated man, and he studied in the Latin and Greek languages. Saint Wenceslaus was peace-loving. He built and embellished churches, and in Prague, the Czech capital, he raised up a magnificent church in the name of Saint Vitus, and he had respect for the clergy. Envious nobles decided to murder the saint and, at first, to incite his mother against him, and later to urge his younger brother, Boleslav, to occupy the princely throne. As the young duke attempted to guide the troubled nation, his mother, Drahomira, and his brother, Boleslaus, instituted a pagan revolt. They assassinated Ludmilla as she prayed, then attempted to overthrow Saint Wenceslaus. The teen took charge, put down the rebellion, and in an act of Christian kindness, expelled his mother and brother rather than executing them. The tiny nation was amazed that the boy would react with such great mercy. With the wisdom of Solomon, the young duke set up a nation built on true justice and mercy. He enacted laws in the manner he thought would best serve his Lord. As king, he labored in the Faith like the great ascetics, and strengthened the Christian Faith among his people. He was strict in ensuring that no innocent person suffer in the courts. In his zeal for the Christian Faith and in his love for his fellow man, Saint Wenceslaus purchased pagan children who were being sold as slaves, and immediately baptized them and raised them as Christians. He translated the Gospel of St. John into the Czech language, and transported the relics of St. Vitus and St. Ludmilla to Prague. He even journeyed out into the country seeking insight as to what his people needed. When possible, he shared everything from firewood to meat with his subjects. He took pity on the poor and urged those blessed with wealth to reach out to the less fortunate. In large part due to Saint Wenceslaus’s example, a host of pagan peasants turned to Christianity. It was a revival unlike any had ever seen in the country. When Saint Wenceslaus married and had a son, all of Bohemia celebrated. Peasants and powerful landlords sought the man out, offering their prayers for long life and happiness. With a smile on his face, the leader assured them that he was praying for their happiness as well. In the years that followed, the duke and his subjects continued to share both their prayers and their blessings with one another each day. Rarely had a leader been as universally revered as was Wenceslaus. And Saint Wenceslaus loved Christmas. Centuries before gift giving became a part of the holiday tradition, the young leader embraced the joy of sharing his bounty with others. Inspired by a sincere spirit of compassion, each Christmas Eve the duke sought out the most needy of his subjects and visited them. With his pages at his side, Saint Wenceslaus brought food, firewood, and clothing. After greeting all in the household, the duke would continue to the next stop. Though often faced with harsh weather conditions, Saint Wenceslaus never postponed his rounds. Like a tenth century Saint Nicholas, the kindly young man made the night before Christmas special for scores of families. For many, a Christmas Eve visit from the duke was an answered prayer and a special reason to celebrate the birth of Jesus. Boleslav invited his brother to the dedication of a church, and then asked him to stay another day. In spite of the warnings of his servants, the holy prince Saint Wenceslaus refused to believe in a conspiracy and exposed his life to the will of God. On the following day, September 28, 935, when Saint Wenceslaus went to Matins, he was wickedly murdered at the doors of the church by his own brother and his brother’s servants. Falling to his knees on the church steps, the dying ruler looked up and whispered, “Brother, may God forgive you.” Then he died. His body was stabbed and discarded without burial. The mother, hearing of the murder of her son, found and placed his body in a recently consecrated church at the princely court. They were not able to wash off the blood splashed on the church doors, but after three days it disappeared by itself. Amazingly, when the young man realized what he had done, the new duke turned away from his colleagues and embraced the faith that had guided his brother’s life and rule. Though he had planned the revolt that had killed his twin, it was Boleslaus who sustained the memory of Saint Wenceslaus. After repenting of his sin, the murderer transferred the relics of Saint Wenceslaus to Prague, where they were placed in the church of St. Vitus, which the martyr himself had constructed (the transfer of the relics of Saint Wenceslaus is celebrated on March 4). The memory of Saint Wenceslaus has been honored from of old in the Orthodox Church. Thanks to the man who killed his brother, the Crown of Saint Wenceslaus became the symbol of the Czech nation. Saint Wenceslaus suffered in the year 935 and his relics repose in Prague. Thro’ the rude wind’s wild lament And the bitter weather. Ye who now will bless the poor,Shall yourselves find blessing. Saint Wenceslaus, who pleased God. But his grandmother-light and faith and hope. And adorned himself with innocence. And with their king they honored God. And he incited Boleslav against Wenceslaus. Wenceslaus asked, but was still beheaded! But the evildoer did not escape God. For his people, that they be strengthened in faith. Saint Wenceslaus, beautiful as an angel! 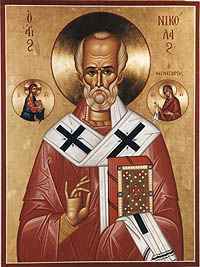 Saint Nicholas, Archbishop of Myra in Lycia, and Wonderworker is famed as a great saint pleasing unto God. He was born in the city of Patara in the Lycian region (on the south coast of the Asia Minor peninsula), and was the only son of pious parents Theophanes and Nonna, who had given a vow to dedicate him to God. As the fruition of longtime prayer of his childless parents, the infant Nicholas from the very day of his birth revealed to people the light of his future glory as a wonderworker. His mother, Nonna, after giving birth was immediately healed from illness. The newborn infant while still in the baptismal font stood on his feet three times, without support from anyone, indicating by this to honour the MostHoly Trinity. Saint Nicholas from his infancy began a life of fasting, and on Wednesdays and Fridays he accepted milk from his mother only but once, after the evening prayers of his parents. From the time of his childhood Nicholas thrived on the study of Divine Scripture; by day he would not leave church, and by night he prayed and read books — fashioning in himself a worthy dwelling-place of the Holy Spirit. His uncle, Bishop Nicholas of Patara, rejoiced at the spiritual success and deep piety of his kinsman. He ordained him a reader, and then elevated Nicholas to the dignity of presbyter, making him his assistant and entrusting him to speak instructing the flock. In serving the Lord the youth was fervent of spirit, and in his proficiency with questions of faith he was like an elder / starets, which aroused the wonder and deep respect of believers. Constantly at work and vivacious, being in unceasing prayer, presbyter Nicholas displayed great kind-heartedness towards the flock, and towards those afflicted coming to him for help, and he distributed all his inheritance to the poor. Having learned about the bitter need and poverty of a certain formerly rich inhabitant of his city, Saint Nicholas saved him from great sin. Having three grown daughters, the despairing father considered to give them over to profligacy so as to save them from hunger. The saint, grieving lest the man perish a sinner, by night secretly brought him through the window three sacks with gold and by this saved the family from falling into spiritual destruction. In bestowing charity, Saint Nicholas always strove to do this secretly and conceal his good deeds. 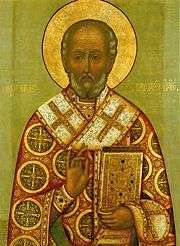 In setting off on pilgrimage to the holy places at Jerusalem, the bishop of Patara entrusted the guidance of the flock to Saint Nicholas, who fulfilled this obedience carefully and with love. When the bishop returned, he in turn asked blessing for a pilgrimage to the Holy Land. Along the way the saint predicted the onset of a storm threatening the ship with inundation, since he saw the devil itself having got on ship. At the entreaty of the despairing pilgrims, he calmed by his prayers the waves of the sea. Through his prayer also was restored to health a certain sailor of the ship, who had fallen from the mast and was mortally injured. Having reached the ancient city of Jerusalem and having come to Golgotha, Saint Nicholas offered up thanksgiving to the Saviour of the race of mankind and he made the rounds of all the holy places, doing poklons and making prayers. By night on Mount Sion the closed doors of the church opened by themselves in front of the arriving great pilgrim. Going round the holy places connected with the earthly service of the Son of God, Saint Nicholas decided to withdraw into the wilderness, but he was stopped by a Divine voice, urging him to return to his native country. Having returned to Lycia and yearning for a life of quietude, the saint entered into the brotherhood of a monastery, named Holy Sion. But the Lord again announced another pathway, awaiting him: “Nicholas, this is not the field, on which thou ought to await Mine harvest, but rather turn round and go into the world, and there My Name shalt be glorified in thee”. In the vision the Lord gave him a Gospel of exquisite workmanship, and the MostHoly Mother of God — an omophor. And actually, upon the death of archbishop John, he was chosen bishop of Lycian Myra — after one of the bishops of the Council gave a decisive reply on the question of choice of a new archbishop — the choice of God as directed him in a vision — Saint Nicholas. Summoned to the flock of the Church in the dignity of archbishop, Sainted Nicholas remained a great ascetic, appearing to his flock as an image of gentleness, kindness and love towards people. This was particularly precious for the Lycian Church during the time of persecution of Christians under the emperor Diocletian (284-305). Bishop Nicholas, locked up in prison together with other Christians, sustained them and exhorted them to bravely endure the fetters, punishment and torture. He himself the lord preserved unharmed. Upon the accession to rule of the holy equal-to-the-apostles Constantine, Saint Nicholas was restored to his flock, which joyfully received back their guide and intercessor. Despite his great gentleness of spirit and purity of heart, Saint Nicholas was a zealous and ardent warrior of the Church of Christ. Fighting evil spirits, the saint made the rounds of the pagan temples and shrines in the city of Myra and its surroundings, shattering the idols and turning the temples to dust. In the year 325 Saint Nicholas was a participant in the I OEcumenical Council (Sobor). This Council proclaimed the Nicean Symbol of faith, and he stood up with the likes of saints Sylvester the pope of Rome, Alexander of Alexandria, Spyridon of Trimiphuntum and others of the 318 fathers of the Council against the heretic Arius. Saint Nicholas, in the heat of denunciation and fired up with zeal for the Lord, even gave the false-teacher a good drubbing on the ears, for which he was deprived of his bishop’s omophor and put under guard. But several of the holy fathers shared a vision revealing that the Lord Himself and the Mother of God had made the saint to be bishop, bestowing upon him the Gospel and omophorion. The fathers of the Council, having concurred, that the audacity of the saint was pleasing to god, gave glory to the Lord and restored His holy saint to the dignity of bishop. Having returned to his own diocese, the saint brought it peace and blessings, sowing the word of Truth, nipping in the bud defective and spurious claims of wisdom, uprooting heresy and healing the fallen and those led astray through ignorance. He was indeed a light in the world and the salt of the earth, wherein his life did shine and his word was mixed with the salt of wisdom. Even during his life the saint worked many miracles. Of them the one accorded the greatest fame was the deliverance from death by the saint of three men, unjustly condemned by a greedy city-commander. The saint boldly went up to the executioner and took hold of his sword, already suspended over the heads of the condemned. The city-commander, denounced by Saint Nicholas in wrong-doing, repented himself and begged for forgiveness. During this time there were present three military officers, dispatched by the emperor Constantine to Phrygia. They did not suspect that they soon likewise would be compelled to seek the intercession of Saint Nicholas: it so happened that they had been vilely slandered before the emperor and were come under a sentence of death. Appearing in sleep to the holy equal-to-the-apostles Constantine, Saint Nicholas called on him to dismiss the wrongful death-sentence of the military officers who, now in prison, prayerfully called out for help to the saint. He worked many other miracles, and asceticised many long years at his labour. Through the prayers of the saint, the city of Myra was rescued from a terrible famine. Having appeared in sleep to a certain Italian merchant and having left him as a pledge of payment three gold money-pieces, which the merchant found in his hand upon wakening in the morning, he requested him to sail to Myra and furnish grain there. More than once did the saint save those drowning in the sea, and provide release from captivity and imprisonment. Having reached old age, Saint Nicholas expired peacefully to the Lord (+ 345-351). His venerable relics were preserved undecayed in the local cathedral church and flowed with curative myrh, from which many received healing. In the year 1087 his relics were transferred to the Italian city of Bari, where they rest even now (about the Transfer of Relics see under 9 May). The name of the great saint of God, the hierarch and wonderworker Nicholas, a speedy helper and suppliant for all hastening to him, is famed in all the ends of the earth, in many lands and among many peoples. In Russia there are a multitude of cathedrals, monasteries and churches consecrated in his name. There is not, probably, a single city without a Nikol’sk temple. In the name of Saint Nicholas the Wonderworker — the first Russian Christian prince Askol’d (+ 882) was baptised in 866 by Patriarch Photios. Over the grave of Askol’d, the holy equal-to-the-apostles Ol’ga (Comm. 11 July) erected the first temple of Sainted Nicholas in the Russian Church at Kiev. Primary cathedrals were dedicated to Saint Nicholas at Izborsk, Ostrov, Mozhaisk, and Zaraisk. At Novgorod the Great one of the main churches of the city — the Nikolo-Dvorischensk church, later became a cathedral. Famed and venerable Nikol’sk churches and monasteries are at Kiev, Smolensk, Pskov, Toropetsa, Galich, Archangelsk, Great Ustiug, Tobol’sk. Moscow was famed by several tens of churches consecrated to the saint, and three Nikol’sk monasteries were situated in the Moscow diocese: the Nikolo-Greek (Staryi) — in the Chinese-quarter, the Nikolo-Perervinsk and the Nikolo-Ugreshsk. One of the chief towers of the Kremlin was named the Nikol’sk. Part of all the churches devoted to the saint were those established at market-squares by Russian merchants, sea-farers and land-goers, venerating the wonderworker Nicholas as a protector of all those journeying on dry land and sea. They sometimes received the name among the people of “Nicholas soaked”. Many village churches in Russia were dedicated to the wonderworker Nicholas, reverently venerated by peasants as a merciful intercessor before the Lord for all the people in their work. And in the Russian land Saint Nicholas did not leave off with his intercession. Ancient Kiev preserves the memory about the miraculous rescue of a drowning infant by the saint. The great wonderworker, hearing the grief-filled prayers of the parents in the loss of their only child, by night snatched up the infant from the waters, revived him and placed him in the choir-loft of Saint Sophia church in front of his wonderworking image. And here in the morning the infant was found safe by his thrilled parents, praising with a multitude of the people Saint Nicholas the Wonderworker. Many wonderworking icons of Saint Nicholas appeared in Russia and came also from other lands. There is the ancient byzantine embroidered image of the saint (XII), brought to Moscow from Novgorod, and the large icon written in the XIII Century by a Novgorod master. Two depictions of the wonderworker are especially distributed in the Russian Church: Sainted Nicholas of Zaraisk — in full-length, with blessing right hand and with Gospel (this image was brought to Ryazan in 1225 by the byzantine princess Eupraxia, future spouse of Ryazan prince Theodore, and perishing in 1237 with her husband and infant-son during the incursion of Batu); and Sainted Nicholas of Mozhaisk — also in full stature, with a sword in his right hand and a city in his left — in memory of the miraculous rescue, through the prayers of the saint, of the city of Mozhaisk from an invasion of enemies. It is impossible to list all the graced icons of Saint Nicholas. Every Russian city and every church was blessed by suchlike icons through the prayers of the saint. The truth of things revealed thee to thy flock as a rule of faith,/ a model of meekness, and a teacher of temperance./ Therefore thou hast won the heights by humility,/ riches by poverty./ Holy Father Nicholas, intercede with Christ our God that our souls may be saved. 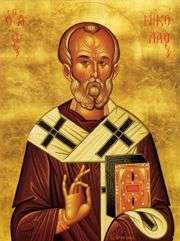 Thou wast a faithful minister of God in Myra,/ O Saint Nicholas./ For having fulfilled the Gospel of Christ,/ thou didst die for the people and save the innocent./ Therefore thou wast sanctified as a great initiator of the grace of God. Suffering, Sin, Sickness & Death Thank you for your prayers for my myriad health problems. I appreciate you sharing the scripture verse you quoted, Isaiah 53:4 and 5: “surely he has borne our grief and carried our sorrows. Yet we esteemed Him stricken, smitten by God, and afflicted, but He was wounded for our transgressions. He was bruised for our iniquities. The chastisement for our peace was upon Him. And by His stripes we are healed.” I do believe that God can and does heal people. This verse is often quoted as well as many others that to many mean that God guarantees a healing if we only proclaim it and have faith. This is not always the case and especially when it comes to anything from God. This part of scripture in complete context talks about the suffering of the Lord and healing us of sin, transgressions, iniquities, and restoring us into a right relationship with God. I do believe sometimes sin and the devil can cause affliction and bad health. However, not all affliction is from sin or of the devil, or even lack of faith. When I look at the complete Bible, there are numerous examples of suffering even for the righteous. In many passages of Scripture it reminds us there will be suffering in this life which God allows us to go through. Some of the suffering is for only a time, some is for this life time, but all suffering, illness and even death will be taken away. Christ conquered sin. Does this mean that since Christ conquered sin, we are no longer sinful? I am sure you would agree that although we have been forgiven of our sins both past, present and future, it does not mean we are any less sinful and we don’t need to confess and repent of our sins or that we are without sin. So as we live out each day, we sin each day and then we need to repent and confess our sins so that we might be healed of our sins. Christ conquered death. Does this mean that since Christ conquered death that we will never die? In one sense, yes, our soul will never die. In the other physical sense, our body will die unless we are blessed to be alive at the glorious Second Coming of Christ. Although Christ conquered death and the grave does not mean that we will not experience a physical death and experience the decay and corruption of a dying body. Christ conquered sickness. So now I ask the question, does this mean that since Christ conquered sickness that we will never be sick? Could there be another meaning? Just like in sin or in death Christ conquered all these things it does not mean that we will be “saved” from all these things. One might say that sin is our own fault and that might imply that we can live a life of perfection because Christ lived as a man and He lived perfectly. However, very few people will ever attain perfection and be without sin even after becoming born again. So is sickness from sin? As I said before that some sicknesses are from sin, but then just because a person is healthy does that mean they are without sin? I am sure you would agree that there are many healthy people that are very sinful people. Likewise there are many healthy people who have no faith at all in God, or a god, and are even atheist in their beliefs. So then we have to realize that sometimes God allows sickness comes in to our lives for the testing of our faith and for to bring glory to God in the midst of our trials, tribulations, sufferings and illnesses. We only need to look at the life of Job in the Old Testament and see how a righteous man is put to the test and although we get the glimpse into heaven and see the conversation between God and the devil, Job had no idea and neither did his wife. Yet we see Job suffering patiently and trusting God with his well-meaning friends offering counsel that maybe he didn’t have faith or their must be some sin his life that God was punishing Job. Yet, then we see God rebuking Job’s friends and never giving an explanation for Job’s suffering but instead declares His Glory to Job and reminds them and us, that He is God and will do as He pleases. We can never make demands of God, we are at His mercy. His will and purposes extend beyond our present vision and this present life. We all have to die sometime in our life (unless the Lord comes). Death is unavoidable. It is not a question of whether or not we will die, we will all die. The question becomes “how will we die?” We will all die from our bodies finally giving out or by some other means. Our bodies from the time we stop growing up are then on the decline and decaying. Death is the final step. I also mean that both physically and spiritually. Even after Christ raised Lazarus from the dead, Lazarus had die again later on in his life. When Christ healed the paralytic, He first said, your sins are forgiven. The Pharisees were in an uproar because they said only God can forgive sins. Christ answered so that they would know that he had the power to forgive, He then healed the man. Christ healed many people but not all people. Those He healed were also “saved”. All of His healings were to demonstrate that He was truly God in the flesh. Throughout Church history and even throughout the New Testament in the lives of the saints of God, illness, suffering, trials and tribulations came to test their faith. The Apostle Paul reminds us that whom the Lord loves He chastens. Jesus said, “in this world you will have tribulations, but be of good cheer, for I have overcome the world.” Earth is not our home and these bodies are still living in a polluted and sinful world. Oftentimes sickness and illness are used by God to build our faith and draw us closer to Him. It is a great testimony to praise God in the midst of the storms of our life and glorify Him and say like Job, “though He (meaning God) slay me, yet will I trust Him” and again Job says, “for I know that my Redeemer lives and I will stand with Him on that day (meaning the day of judgment)”. Through sicknesses and trials we are reminded that this is earth and not Heaven and that Heaven is truly our home and we have the Eternal hope that all sorrow and sickness and tears will be wiped away. I will close with these passages of Scripture: 1 Peter 1:3 -7: “Blessed be the God and Father of our Lord Jesus Christ, who according to His abundant mercy has begotten us again unto a living hope by the resurrection of Jesus Christ from the dead, to an inheritance incorruptible, and undefiled, and that does not fade away, reserved in heaven for you, who are kept by the power of God through faith unto salvation ready to be revealed in the last time. In this you greatly rejoice, though now for a little while, if need be, you have been grieved by various trials, that the genuineness of your faith, being much more precious than gold that perishes, though it be tested by fire, may be found to praise, honor, and glory at the revelation of Jesus Christ, Whom having not seen, you love. Though now you do not see Him, yet believing, you rejoice with joy inexpressible and full of glory, receiving the end of your faith, even the salvation of your souls.” 1 Peter 4:12-13 “Beloved, do not think it strange concerning the fiery trial which is to try you, as though some strange thing happened unto you; but rejoice, to the extent that you partake of Christ’s sufferings, that when His glory is revealed, you may also be glad with exceeding joy.” 1 Peter 5:10-11 “But may the God of all grace, who called us to His eternal glory by Christ Jesus, after you have suffered a while, perfect, establish, strengthen, and settle you. To Him be glory and dominion for ever and ever. Amen. Please pray for me as I pray for you that we both may glorify God in all things. Immigration Crisis-A Call for Compassion & Change.